Unfortunately, I don’t know who my neighbors are. If I ever need anything, I’m not sure if I would ask them to help me, even though they live 4 ft away. 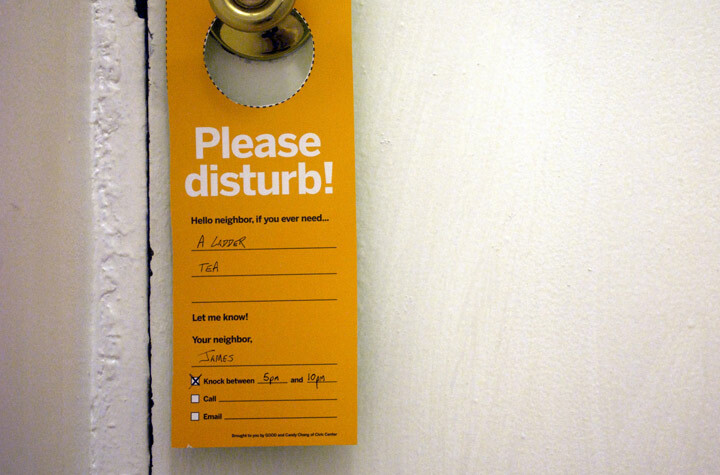 Thinking about it, Candy Chang, an artist now based at New Orleans, developed these ‘Neighbor Doorknob Hanger‘ where you can state if you have anything to share or you need, with the people that live in the same building as you. Very simple and effective and nice!